Happy V-Day to you too! Hope you’re enjoying that pizza 🙂 I think you and I are very much of the same mind about accessories. For me it’s more than just matching a shirt, you know? My photos. Memories. As for news, I try NOT to keep up simply because I don’t want to get depressed. Too much going on and none of it good. I can’t stop it, and I already pray, so why keep reading/watching it? I do have my favorite pieces of jewelry, but I made them myself using objects that were given to me, or photos I treasure, photoshopped to a small size and enhanced. I collect recipes that I could never make if I used a different one every meal and lived another 100 years. Tons of recipes, just because I can. Enough yarn to open my own shop. I’ve gone beyond collector to hoarder in some categories. Yarn is an easy one to accidentally start hoarding. I always develop big knitting plans when in the yarn store, then put off making the hat or scarf or whatever because I get caught up in my other crafts. I’d love to see these special jewelry pieces you’ve made! I hope you feature them in a post, they seem sound very special. I keep ordering new yarn to make sure I have “enough” to finish all the afghans I plan to make by next Christmas, when actually all I should have to do is put what I have in groupings for the already planned afghans. I think I would have enough for the extended family, but the truth is, I always find new and pretty yarn online, and order some, then have to order more to go with that, so on it goes. I’ll try to find the jewelry eventually and post about it. Right now a lot of things are stored in boxes for the move, if/when it takes place. That could be a year from now. They don’t tell us anything any more, after giving us so much false information for the past two years. Thanks VB, but is any move pain free? Or stress free, for that matter. If they would just tell me when and where it will be it would help. I think they are making it up as they go along. Sounds like they are trying to make it as stressful as possible. Ridiculous behaviour. I’ve been working on breaking my sentimental attachment to things for years because I’ll keep everything and I’ve been trying to teach myself that I’m not my things(if I sound corny then whatever, it’s from Oprah!) but this does resonate with me. I have a hard time giving up stuff with memories but I’m getting better at it. Happy Valentine’s to you too!!! It’s hard to get rid of some of the silliest stuff- like movie stubs, or match books. I really admire the people who are able to rid themselves of the clutter. That is such a good point on how it can’t be replicated by other objects. It’s a specific item for a specific memory, which is so true. Oh my! The photo you used for this post is just amazing! It seems every family has a jewelry story….well done. 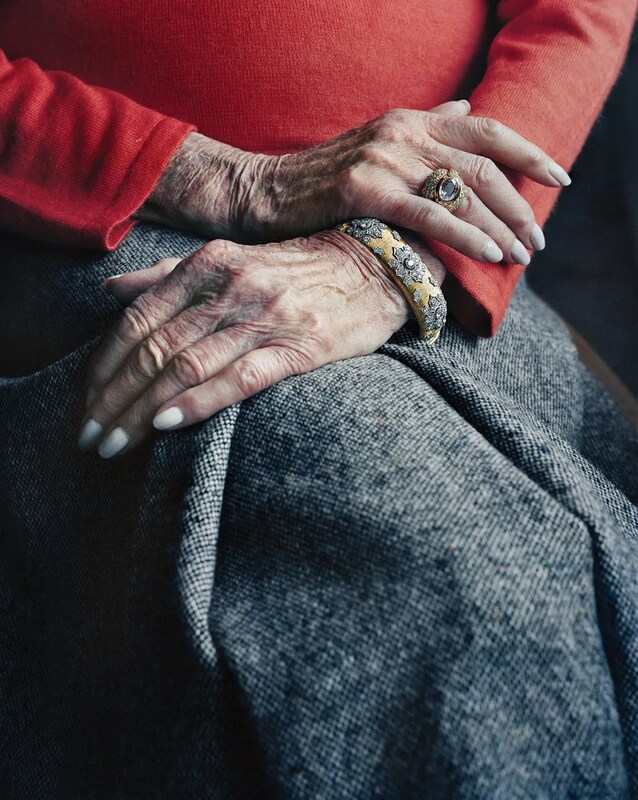 This photo is from the linked article- I love it’s composition, the hands, and jewelry. It’s just great, and the NY Mag article is definitely worth the read. I recommend it. I’m not especially sentimental, but I do have a piece of “jewelry” that has a lot of meaning. My great grandmother passed away last year. She had this necklace that she wore every day, with eight charms, one for each of the 10 commandments, minus two that she lost. But I remember her always talking about how the two she lost were the two that she had the most trouble with following. Now I have it, and I will tell my children (if we ever have any) the same story! It’s a great piece of family history!